Originally published in The Western Depot newsletter. BC Rail, known as the British Columbia Railway between 1972 and 1984, and as the Pacific Great Eastern Railway before 1972, was a railway that operated in British Columbia from 1912 to 2004. At its peak, it was the the third largest railroad in Canada, operating 1,440 miles of mainline track. BC Rail was incorporated as the Pacific Great Eastern Railway (PGE) in 1912 in order to build a line from Vancouver, BC to a connection with the Grand Trunk Pacific Railway at Prince George. The PGE was provincially-sponsored, and was originally meant to unify British Columbia under one rail system. However, at it’s start it ran into much criticism, often called “the line from nowhere to nowhere” since it ran between Pemberton and Lillooet, two small communities in rural, inland British Columbia. In 1915, PGE extended the main line south to Squamish, and north to Chasm, growing the line to over 175 miles. Also in 1915, PGE failed to make an interest payment on its bonds. This caused a legal battle between the founders of the railroad, Timothy Foley, Patrick Welch, and John Stewart, and the British Columbian government, which eventually led to the railway being be turned over to the government. At the time of the government takeover, PGE had two sections of track: one between North Vancouver and Horseshoe Bay, and one between Squamish and Clinton. After the takeover, the government extended the railway to a point 15 miles north of Quesnel, which was later removed. For the next 20 years, the PGE did not connect with any other railway, and there were no large urban centers on its route. It mainly connected logging and mining operations of the British Columbia Interior with the coastal town of Squamish, where these resources were transported by sea. Resources were not available for the government to expand the railway to the intended target of Prince George, and to its detractors PGE came to stand for “Province’s Great Expense”, “Prince George Eventually”, “Past God’s Endurance”, and “Please Go Easy”. Finally beginning in 1949, there were financial allocations that allowed the Pacific Great Eastern to begin to expand. Track was laid north of Quesnel to a junction with the Canadian National Railways at Prince George. Between 1953 and 1956, the PGE constructed a line between Squamish and North Vancouver. 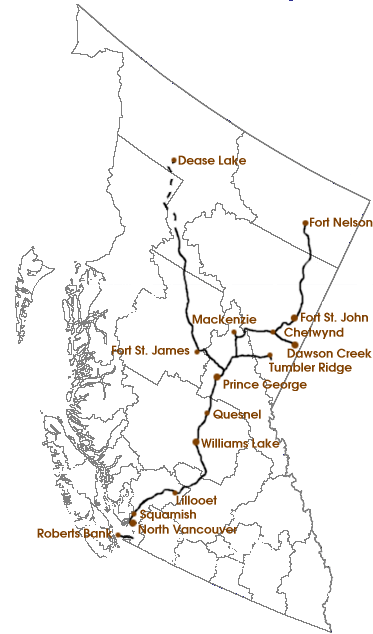 In the 1960s, the PGE was extended from Fort St. John 250 miles north to Fort Nelson. In 1972, the PGE became the British Columbia Railway (BCR). Then in 1984, the BCR was restructured. Under this new organization, BC Rail Ltd. was formed, owned jointly by the British Columbia Railway Company and BCR Properties Ltd. At this time, the rail operations became known as BC Rail. Still known as the BCR, the railway began to expand from Fort St. James to Dease Lake in the 1970s to take advantage of asbestos and copper in the area. However, before the line was even completed, worldwide demand for both asbestos and copper fell dramatically and the line was never finished. Construction stopped in 1977, when there had already been 263 miles of track laid. It had cost $168 million to reach that point. Parts of the unfinished Dease Lake extension were used to serve the logging communities at Driftwood. Once logging operations ceased in 1983, traffic fell sharply and the Dease Lake line was closed. BC Rail opened the Tumbler Ridge Subdivision to the Quintette and Bullmoose mines in 1983. This was an 82 mile electrified branch line that had the lowest crossing of the Rocky Mountains by a railway at 3,815 feet. This line ran through two large tunnels: The Table Tunnel at 5.6 miles long, and The Wolverine Tunnel at 3.7 miles long. The Tumbler Ridge Subdivision was electrified partly due to these two long tunnels, and partly due to its proximity to the W.A.C. Bennett Dam and transmission lines. This was one of the only electrified freight lines in North America. Although initially profitable, traffic was never as anticipated. By the 1990 traffic was under one train per day. These unprofitable operations could not repay the debt incurred in building this line, and in 1984 BC Rail acquired the British Columbia Harbors Board Railway, a 23 mile line connecting three Class I railways with Roberts Bank, an ocean terminal that handles coal shipments. Through the 1990s the provincial government reduced subsidies to BC Rail, which led to the outstanding debt growing over sixfold between 1991 and 2001. BC Rail tried to overcome the ever increasing debt by branching out into shipping operations, acquiring Vancouver Wharves in 1993 and Canadian Stevedoring in 1998. In 1999, Vancouver Wharves, Canadian Sevedoring and its subsidiary Casco Terminals were spun into a new entity, BCR Marine. In order to reduce mounting debt, BC Rail sold off the BCR Marine assets except Vancouver Wharves. Further hardships ensued when in 2000, the Quintette mine closed and a portion of the Tumbler Ridge Subdivision was abandoned. The Bullmoose mine closed in 2003, after which the remaining 70 miles of the Tumbler Ridge Subdivision was abandoned as well. Passenger service ended in 2002 and many of the RDC locomotives used by BC Rail were decommissioned and either scrapped or sold to museums around North America. Also around this time BC Rail ended intermodal service. On November 25, 2003, the $1 billion bid by Canadian National was accepted by the government, and operation was handed over to CN on a 60 year lease. – republished from The Western Depot newsletter.